A horse trailer, whose driver stopped for some grub at the adjacent restaurant in Texola, OK.
Texola has a population of just 36 souls, and the restaurant there makes a meager but steady income from truck drivers a of all kinds. I thought it notable here that the horses in the above photo were saddled, so the trip couldn’t be that long. 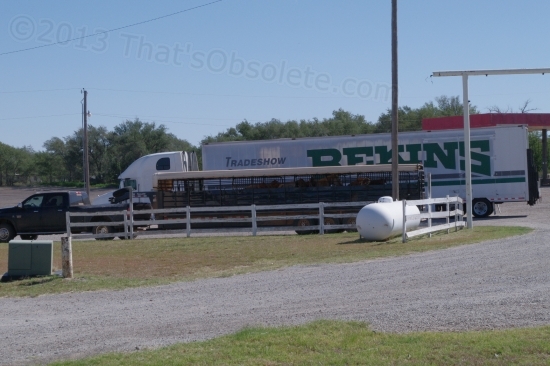 Next to it was a Bekins moving van specializing in moving show and display hardware. What can I say? I have a low threshold of entertainment. After taking a vacuum cleaner to the rig, I hung most of the framed pictures. Then I worked on trying to prevent the stored solar panels from shifting during transport and pinching off the passageway between the living room and the front office. To do that, I cut up a 1×2 and made a frame that just fits around the bottom of the stack. In theory, the panels can no longer squirm around enough to choke the passageway off. It’s still tight to get past, but not inconveniently so. I also trimmed off the protruding sanding pad edges that were actually what the panels rested on. In the original installation, the pads not only stuck out well past the aluminum frames, but became what the panels were actually resting on. This made them tippy and torqued the frames a bit in a way that made me think that this might be a bad thing. 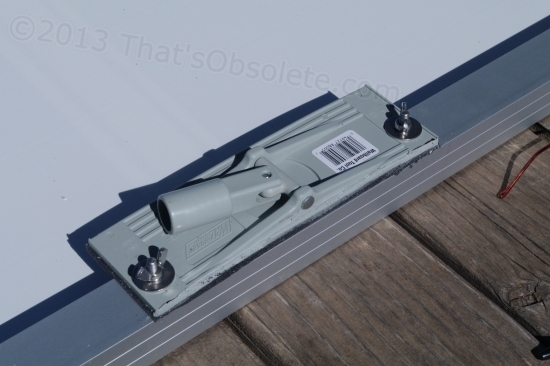 I have no idea just how much handling abuse these panels can take, since they are designed to mount permanently on a roof and never move, and here I am, banging them around to get them either hung or stowed. 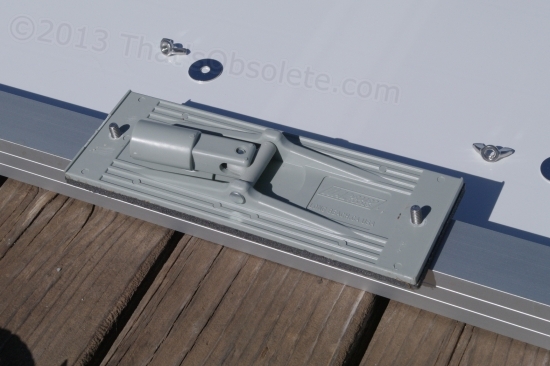 So I used a tile cutter mounted to my trusty Milwaukee 4.5″ grinder and hacked off the offending pad edges – except that I could only take so much off without ruining the articulating pole receiver hardware. So, I also drilled new holes in the pads and relocated them on each frame as needed. Now, there is no protrusion at all, and each frame lower edge rests flat on the carpeted floor. I’m so proud of myself: pat, pat. 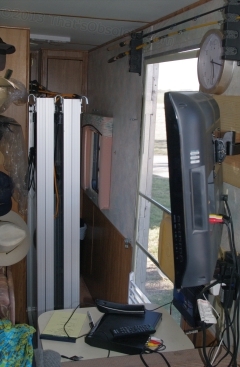 The top end of each panel is retained by a couple of bungee cords, which will allow some movement as the trailer tosses side-to-side on bad pavement – this is about 160 pounds of panels, mind you. Second-born offspring Tom had given me an adjustable strap tie-down, but it’s too long even at its shortest setting. Perhaps I will come up with a brilliant solution before the panels are slammed once too often. 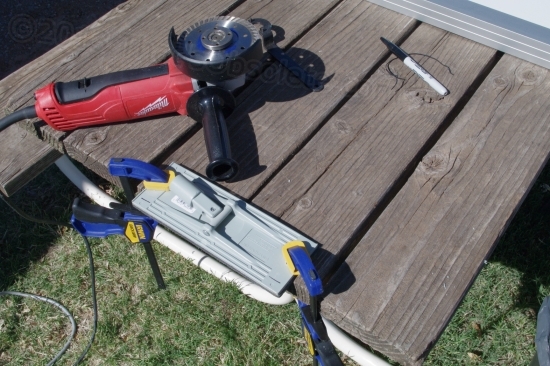 I would simply extend the strap down to reach a hook or eyelet on the floor-mounted frame, but I’m not sure that the wood wouldn’t tear out from the strain, or that I wouldn’t trip over it when the panels are outside in use. Gotta ruminate on that. Until then, I’ll find something to use as padding during transport. my hands. The smooth aluminum frames on those panels seemed unusually hard to hold today. It could be done, but it seemed more difficult than it was during construction. If I can’t find anything to practice on, I’ll have to regularly hoist the frames themselves just for fun (?). It’s one of those “use it or lose it” things. I don’t care to be in a position where I’m unable to hang these puppies, possibly putting this whole fiasco at risk. I shouldn’t worry about it though – I’ll probably be broke before then anyway. The parade of pics follows below. This is the pad as we originally installed it – in a big hurry. The 45-pound panel rests on that protruding edge, which is a lot of weight. Not good. This is the picnic table being put to good use. 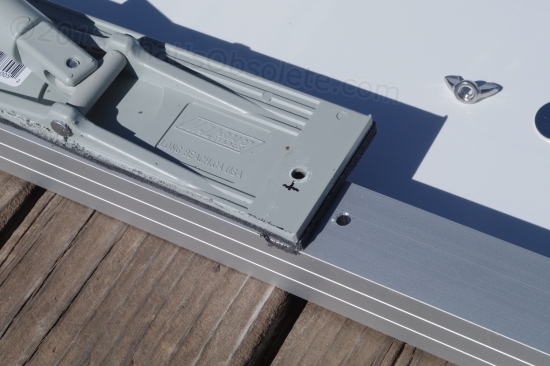 Some of the protruding edge is removed with the grinder – carefully. Because only so much can safely be hacked off, the pad must also be relocated by drilling new mounting holes. Presto, no protrusion. Voila – a symphony of excellence…maybe. At any rate, the frame end now rests flat on the floor. I suppose my next post will be about how I fitted the wood too closely and could no longer fit the frames inside, but it looks good right now. I had to venture 7 miles to find screws long enough to go through wood, carpet, and flooring, but it ended fairly well. Hopefully, I won’t be reporting any short circuits or gas leaks in the near future. Looks pretty tight to get past, no? This is where every inch counts. 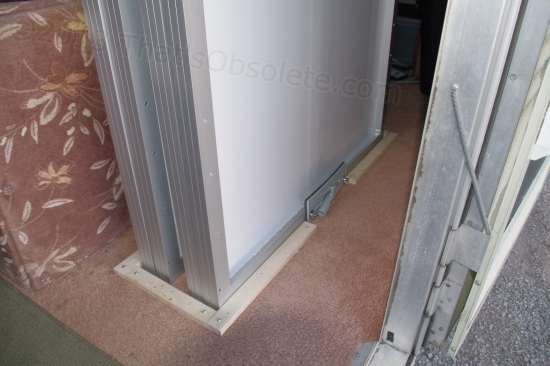 Before, the panels shifted around on the floor so that the far (forward) end squeezed in too tightly to get by. Now they will stay square. Let’s just hope that I don’t do a head-on – they will want to proceed toward the tow vehicle in whatever way they can, with disappointing results.